If you haven’t seen the new Science and Math Complex (SAMC) at Buffalo State, here’s your chance. Biology, chemistry, earth sciences, mathematics, physics, and science education faculty members have organized an event to encourage area high school students to study math and science. Parents and teachers are also invited to attend. Science and Mathematics Day will be held on Monday, May 19, from 4:30 p.m. to 7:30 p.m. in the atrium of the campus’s new Science and Math Complex. Michael DeMarco, professor and chair of the Physics Department, and David Henry, associate professor of elementary education and reading, are spearheading the event. 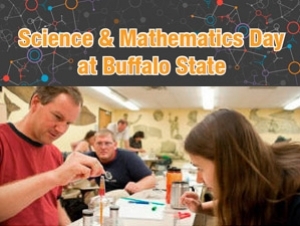 “We want to show off the new building and introduce area students and teachers to Buffalo State’s science and math faculty,” said Henry. Henry is co-director of the New York State Master Teachers program at Buffalo State. A number of master teachers are participating. Master teachers are outstanding STEM (science, math, engineering, and technology) teachers who teach any of those subjects in grades 6 through 12, and who have been accepted into the Master Teachers program. New York State Governor Andrew Cuomo recently announced a full SUNY scholarship for top-performing students who pursue and work in the STEM field in New York State for five years after graduation. “A group of the master teachers are working on Make and Take projects,” said Henry. Such projects include an LED Throwie, a Lava Lamp, and—under DeMarco’s guidance—an electronics soldering project. Buffalo State students will be leading tours of the building every 15 minutes. Tours will include visits to the physiology and microscopy labs, the Microbiology Center, the Imaging and Spectroscopy Center and the Great Lakes Center. The NMR, X-ray crystallography, confocal microscope, and electron microscope will be demonstrated. “We will also tell students about the scholarships we can offer them,” said DeMarco. Presentations also feature the successful launch of Bengal I in 2013 and Bengal II earlier this month. Buffalo State students successfully launched weather balloons into space and recovered them, obtaining video of the event from a camera on the space crafts. Jamie Szafran, computer scientist, software engineer, and aerospace technologist at the NASA Kennedy Space Center, will discuss STEM careers and opportunities at NASA in the Science Building 272, at 6:00 p.m. At 6:30, Will Kinney, associate professor of physics at the University at Buffalo, will discuss his study of the cosmos and what happened before the Big Bang. Kinney will speak in Bulger Communication Center South.